Across the Tagus Estuary from Lisbon is Almada, a former industrial quarter that has been given a facelift since the 1990s. Today people make the crossing from the capital to dine with views of the river and Lisbon, or to unwind on the long chain of beaches on Almada’s Atlantic coast. Another reason to come is for the mighty Cristo Rei statue, which was modelled on Christ the Redeemer in Rio and completed in 1959. On the Ginjal riverside road there lots of fragments of Almada’s old shipbuilding and fishing industries; one of the warehouses has been turned in to a maritime museum and in a dock in Cacilhas is Dom Fernando II e Glória, the last wooden frigate launched by the Portuguese Navy. On a hill 85 metres above the south bank of the Tagus Estuary is Portugal’s answer to Christ the Redeemer. This monumental statue is slightly smaller than the Rio landmark that inspired it, and stands at just under 80 metres. It had been planned since the 30s when Lisbon’s Cardinal Patriarch travelled to Brazil, but was completed in 1959 in thanks to God for keeping Portugal out of the Second World War. On the statue’s pedestal, which you’ll scale by an elevator and then a flight of steps, you can see the entire Tagus Estuary, Lisbon’s historic quarters and the 25 de Abril Bridge. Another of Lisbon’s identifiers, this suspension bridge has been conducting traffic over the Tagus between since 1966. More than 50 years after it was completed it is still counted among the 30 largest suspension bridges in the world, at 70 metres high and 2.7 kilometres in length. You might also spot a resemblance to the bridges in San Francisco, and this isn’t a coincidence as it was built by the same company that made the San Francisco-Oakland Bay Bridge. The upper level is for road traffic on the IP7, while the lower level has Linha do Sul railway line. On Almada’s northwestern point, Cacilhas is a vibrant waterfront neighbourhood. This is where you’ll find the Lisbon-Almada ferry terminal, and until the 1990s Cacilhas was the home of Lisnave – Estaleiros Navais de Lisboa shipyards. Since then the neighbourhood has been revitalised today it’s a place to hang out, gaze across the Tagus, grab a drink or a meal at one of the many seafood restaurants. Rua Cândido dos Reis is pedestrianised and laid with restaurant terraces, while the riverside Rua do Ginjol has a unique atmosphere for its decaying old warehouses and dreamy views. 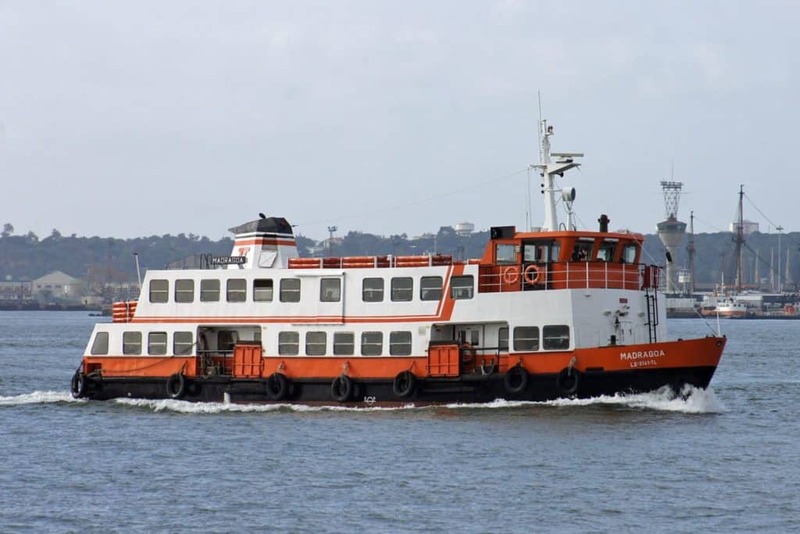 There are ferries at approximate 20 minute intervals from the port at Cacilhas across the Tagus to Lisbon’s Cais do Sodré. The last boat doesn’t depart until after 01:00 am, so you’ll have plenty of time to linger over an evening meal or drink in Almada. The crossing takes 15 minutes and at €1.25 for a single is a thrifty sightseeing trip, giving you a fresh perspective of the marvellous 25 de Abril Bridge, Lisbon’s historic quarters on the north bank and back to the Cristo do Rei on its elevate perch. After landing at Cais do Sodré you won’t need more than a couple of minutes to get to some awesome sights and attractions. The Time Out Market is a cavernous food court in the Mercado da Ribeira. With lots of stalls and pop-up restaurants it’s a nifty way to sample the best of Portuguese cuisine, which you’ll enjoy at sociable communal tables. Just along from there is the ostentatious 18th-century architecture of the Praça do Comércio, the Lisboa Story Centre and the National Contemporary Art Museum. And then on a rise above the quays is the 12th-century Lisbon Cathedral. All less than ten minutes on foot from the Cais do Sodré. Permanently docked in Cacilhas is a restored 19th-century frigate that was launched in 1843. 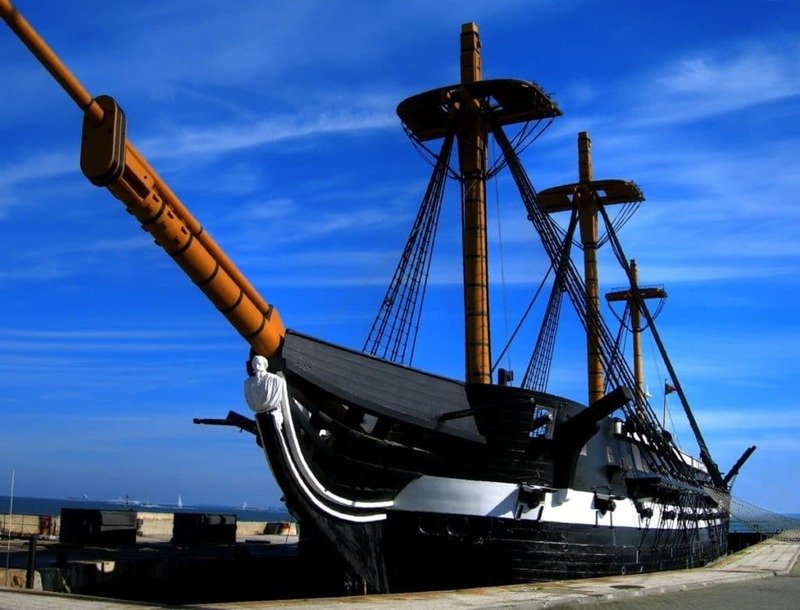 The 50-gun boat was in service until 1878 and still had a ceremonial role in until 1940, as the last wooden-hulled sailboat built by the Portuguese navy. From then on it was used as a heritage and educational vessel until it was destroyed by fire in 1963 and towed to mudflats on the Tagus where the hull was abandoned for 30 years. In 1998 an eight year restoration was completed, and for the last decade this museum ship has been docked in Cacilhas for people to board and see how the crew lived and worked on long voyages to Portugal’s old colonies. In Cacilhas you’ll feel very connected to Lisbon, so what will strike you about the beach at Fonte da Telha is just how far away the city seems. It’s only 20 minutes around the coast and is in a long natural park south of Costa da Caparica. The beach, with white sand, goes on for several kilometres and is backed by limestone cliffs covered with juniper and pine scrub. There’s zero development here apart from the little village of Fonte da Telha. The waves are often surfable, but if you’re happy to relax on the shore you’ll have vistas of the Sintra Mountains, while dolphins are often sighted from the beach and the sunsets are to die for. The beaches continue right the way up to the mouth of the Tagus. This northern part a little more touristy, but the beaches remain broad and natural. Costa da Caparica is the main resort here, and it has a string of bustling beaches in summer, as well as restaurants and schools and centres to kit you out for surfing, windsurfing, kitesurfing and bodyboarding. In summer it’s a young and hip place to be, with a party atmosphere and all sorts of cool hangouts. And maybe the best thing is that it’s all authentically Portuguese as few foreign tourists make it to the Costa da Caparica. Many visitors cross the Tagus just for this attraction, which is attached to the cliff on the riverfront. For a small fee you can ride the elevator that takes you down from the cliff-top to a landscaped garden by the water’s edge (Jardim do Rio). Day or night the sight of Lisbon over the water is one to treasure. On the Almada side you can see the ruined shipbuilding warehouses that line the wharf. The elevator was one of the first regeneration projects for the waterfront and opened in 2000. At the top there’s a cafe also blessed with astonishing views. High above the riverbank is a beautiful old mansion that was acquired by the city in 1988 and soon turned into a contemporary art centre. You can potter around here for a couple of hours, perusing the exhibitions, which are mostly for local artists and updated every few months. Outside are creatively themed gardens dedicated to pigments (various flowers), fabrics (cotton and flax), oils (lavender, rosemary) and a cherry plantation, as these trees produced the gum used in early paints. After you get a tea or coffee at the cafe and find a spot on the terrace to take in the Lisbon skyline, Tagus and 25 de Abril Bridge. In the protected coastal landscape to the west is a former convent of the Order of St Francis. It dates to 1558 and was built by Lourenço Pires de Távora, an important diplomat who was the governor of Tangier for a time in the 16th century. Being a Franciscan convent, the building is discreet, but the facade warrants a look for its tile panels depicting the life of St Francis and the coat of arms of the powerful Távora family. Another reason to visit is to see the Atlantic, the north bank of the Tagus and the Costa da Caparica from the belvedere a short walk from the convent. Up to the 1990s the ocean was integral to Almada’s identity and livelihood, and by the Tagus on the Rua do Ginjal is an engaging museum safeguarding some of this heritage. The attraction is set in a long warehouse that belonged to the Olho-de-Boi fishing company, which once operated one of Portugal’s largest trawling fleets. All of Almada’s former industries are represented, including shipbuilding, ship repair and fishing. In the hall you can inspect an antique forge and carpentry tools, rigging, model ships, a vintage diving suit and bellows. 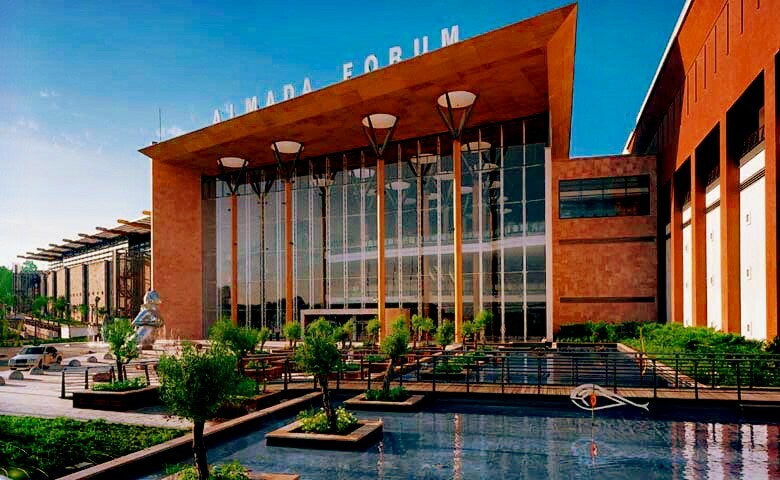 The third-largest shopping mall in Portugal is in Almada, just next to the Parque da Paz. This stylish centre was officially opened in 2002 by the Prime Minister, and garnered acclaim as the “Best New Shopping Centre in the World” in 2004. The mall, set on three floors, welcomes around 18 million visitors a year and is enormous taking up the equivalent of 10 football pitches. If there’s something you need, all of the big mainstream fashion stores like Zara and H&M are here, as well as a supermarket, restaurant and a cinema. A neat touch is the cafe seating by the fountains. 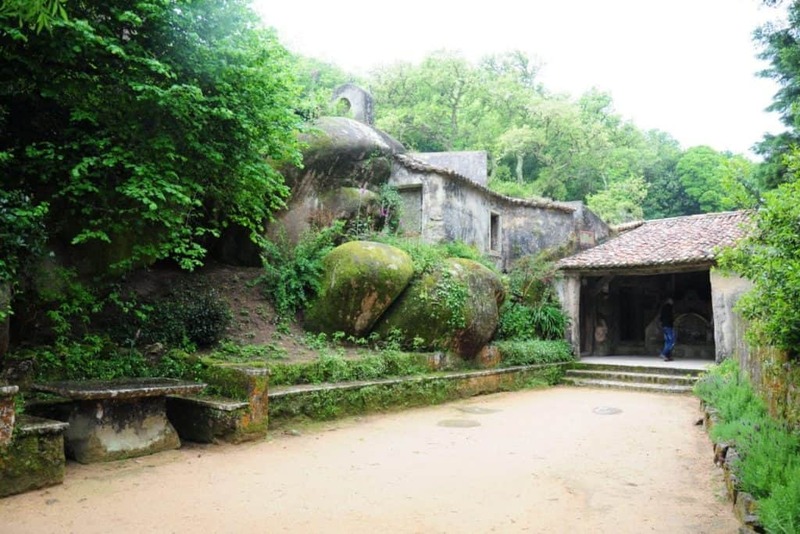 For some greenery you could hop on the Metro for a couple of stops to Cova da Piedade to while away an hour or so. 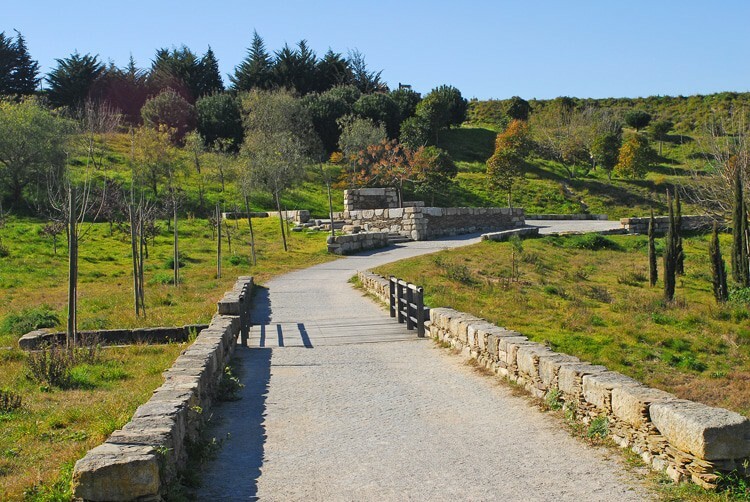 Another aspect of Almada’s regeneration in the 90s, the park is more than 60 hectares and has leafy rest areas, a large lake, tree groves and expansive lawns. There are more than 110 tree species in the park, among the olive trees, cypresses , spruces and pines. The prolific modern sculptor José Aurélio designed the 26-metre-high Monumento à Paz. There’s no limit to the amount of memorable places you can visit either by car or public transport. Just west of the 25 de Abril Bridge is the Belém Quarter, hosting the namesake watchtower and the Jerónimos Monastery, both UNESCO Site and listed in Portugal’s Seven Wonders. Of course there’s a lot more of Lisbon waiting for you, but to the west there’s also Sintra and its collection of Royal palaces. You could also set your sights south on the wild splendour of the Parque Natural da Arrábida, where there’s rich woodland and secluded coves at the foot of the tallest cliffs on mainland Portugal.